Despite being two goals down twice to Stranraer at the weekend, striker Anton Dowds says the Fifers never felt out of the game. 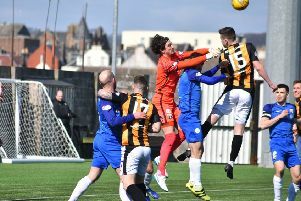 Stranraer managed to build up 2-0 and 3-1 leads over East Fife on Saturday, but the Fifers came roaring back to win the game 4-3. Conditions played a big part in the turnaround, says Dowds, with East Fife knowing they could score every time they got up the park. The striker, who scored a brace on Saturday, said: “With the boys we have in the changing room, there’s a great determination there. “And because of the conditions, when you get the ball forward there was always going to be chances. “Stranraer showed that in the first half an hour. “They took their chances well and we had a couple as well which we didn’t, take so went in at half time 2-0 down. East Fife brushed themselves down a couple of times in the game, and Dowds reckons the players deserve credit for that. “We had confidence in ourselves,” he said. “It was one of those games where people make mistakes, we all make mistakes, but it’s about how react to one another. “That shows the togetherness in the dressing room. “In this league, if you’re not concentrating, you can lose it because chances do occur. “If they fall kindly for you and you take them then these turnarounds do happen.